Housecall Pro is a SaaS field service management platform that offers a breadth of features and is fully scalable for a range of business sizes from single service professionals to multi-user operations, based in the US and Canada. 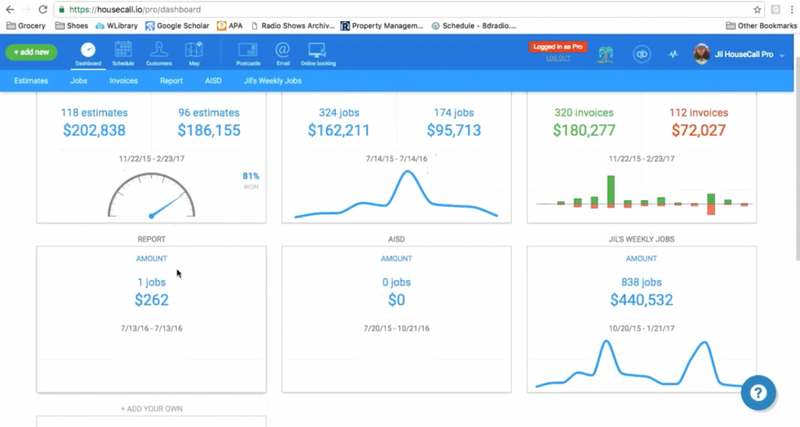 Built around a central cloud management dashboard, Housecall Pro also offers two complementary apps, one for end customers and another for the service professional. 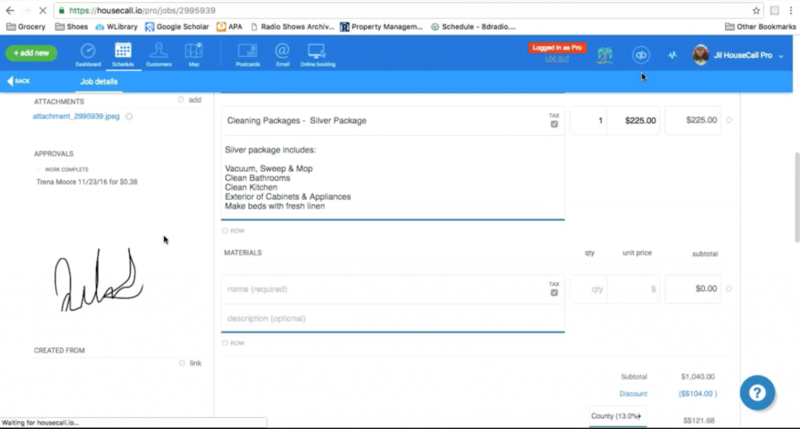 Housecall Pro’s cloud dashboard centralizes all the functionality from across the suite of tools and acts as a database and record management system which seamlessly links with the two apps. The dashboard offers role-based logins, so users can access the level of functionality they require, which is especially useful for multi-user operations. The dashboard offers a range of functionality that goes far beyond scheduling and diary management – although that is present. 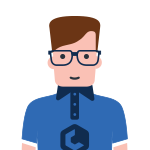 Admin users can create and edit customer jobs, build out a pricing quote based upon individual preset products or services, or custom line items, before assigning them to a service professional, or themselves. This job is then reflected in the professional’s own dashboard and calendar, as well as on the service app. 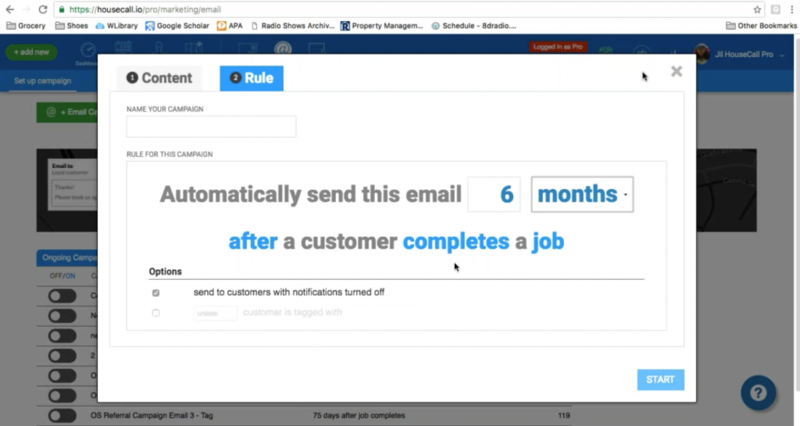 The platform offers seamless communication via text message and email to both the service professional to update them on jobs, as well as the customer. This ensures that all parties involved are well-managed and informed. The dashboard also offers full customer management functionality including billing history and invoices, job history, notes and location data. All of which ensures that repeat customer details are easily managed and accessible. Plus, the dashboard also offers some impressive online and offline marketing functionality that takes the platform beyond a scheduler. Users can create marketing emails from within the dashboard to send to customers, both individually or on a bulk basis. These can be sent immediately or scheduled based upon behavioral triggers – such as time elapsed since the previous job. This makes customer retention management easy with no customer being forgotten. In addition, Housecall Pro also offers offline postcards to further engage with customers. Users can build out their own design and for a small fee they are printed and posted directly to the customer. With inbuilt GPS functionality, field professionals gain visibility of the job location via the service app, and admin users can plot the most efficient job routes as well as accessing live location updates of their team in the field. Finally, end customers are also offered direct booking functionality so they can create their own jobs that are instantly added to the schedule. 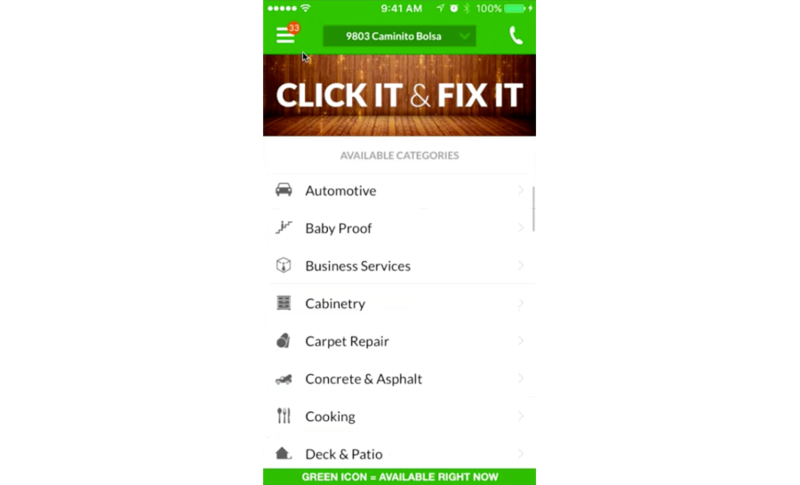 The Housecall Pro service app offers a more critical view for the professional in the field. Presenting a schedule view that allows the user to see their personal job schedule and access each individual job detail by clicking the record. 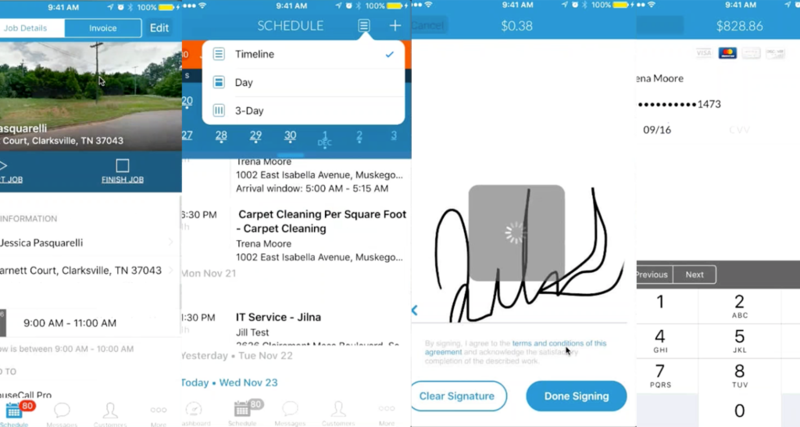 The job record includes address details, location snapshots from Google, and full job detail. The user can also click to notify the customer that they are en route to ensure they are continually managed along the way. Once the job starts, the service professional can add notes and live photos to the job record, as well as the ability to recalculate the invoice if the job changes or add discounts to amend the invoice total price. Once a job is completed, the professional can then present the customer with terms and conditions and a countersign screen to ensure each job is completed satisfactorily and verified. Payment can even be taken via a live credit card processor inbuilt to the app, with invoice being emailed instantly to the customer or printed, and the job closed. All updates, photos, invoices, and data are stored centrally for security and efficiency and can be accessed at a later date. The functionality and simplicity of the UI within the app means professionals are highly mobile, can work efficiently and can be on-boarded very quickly. Finally, the Housecall Pro customer app is ideal for regular private or commercial customers, making the booking of repeat jobs simple. The app also acts as a gateway to all the professionals within their area using the service app and software. The customer can access and search different service professionals, check ratings and see the professional’s headshot and location, before booking jobs with them, even if they haven’t previously. Overall, Housecall Pro is a highly dexterous and powerful SaaS toolset that supports individual service professionals as well as offering scalability for multi-user service organizations. It combines a range of functionality from different software that reduces the need to run or integrate multiple systems. Ultimately the product is focussed on delivering the best service for the customer, which it certainly delivers, making it a highly compelling and impactful product. Software as a service (SaaS) is an important and crucial thing for any business from small scale to large scale. Well this blog is really good about the SaaS.